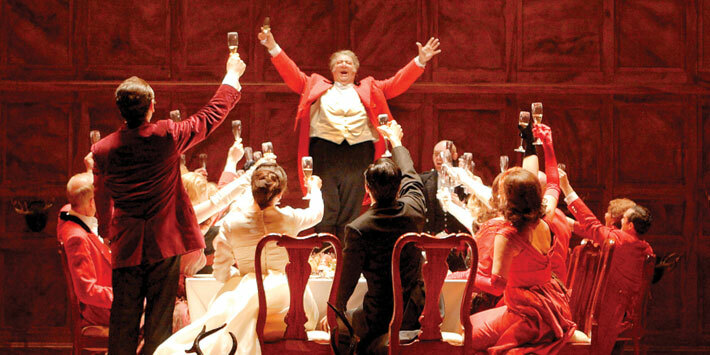 The Met’s new production of Falstaff, opening tonight, replaces the long-standing Zeffirelli production with a staging directed by Robert Carsten – and it brings James Levine back to the pit for what he has declared to be his favorite Verdi opera. “The great dream has come true,” wrote Arrigo Boito, the librettist of Verdi’s Otello and Falstaff, shortly before the former opera was unveiled in 1887. Otello‘s premiere was an internationally feted success, bringing to fruition a proposal that had started eight years earlier when it was tentatively broached over the course of a dinner conversation. Boito refers to Verdi’s dream of creating a new opera based on his beloved Shakespeare, but he might just as well have marveled at the feat of luring the aging composer out of his self-proclaimed retirement from the opera stage. Otello didn’t just represent a late-career comeback: it marked the summit of Verdi’s achievement as the greatest of Italy’s operatic tragedians. Verdi had become so identified with the tragic genre that Otello must have seemed the perfect culmination of his life’s work. Yet Boito was determined, as he put it in a letter to a friend, “to make that bronze colossus resound one more time.” Verdi, for his part, had long harbored a desire to prove that the scope of his art extended beyond the dramas of gloomy passion with which he had built his reputation.